Syria, Sept 19: Fighting in Azaz — Local Dispute or Start of a “War” Among Insurgents? US Secretary of State John Kerry has said that a United Resolution for Syria’s handover of chemical weapons must be enforceable and must happen as soon as possible. Kerry said the Security Council must live up to its values and make the US-Russia framework agreement for inspection and destruction of the chemical weapons a “meaningful” one. In an official statement on Thursday, the Liwa al-Islam Brigade accused the Assad regime of deliberately fabricating video footage purporting to show its fighters firing chemical weapons. The videos, disseminated on YouTube, gained a degree of prominence when blogger Brown Moses wrote about them. Liwa Al Islam said that the videos were not published on their official channels and that they were “forged and completely fake”. “Liwa al-Islam does not have the kind of artillery shown in the videos. Only the Assad regime has this capability. Furthermore, this kind of artillery cannot in any way carry warheads that might be filled with chemical weapons,” the statement read. Liwa Al Islam accused the Assad regime of also faking a video showing its members beheading soldiers, which it called a “cheap lie”. “Liwa al-Islam denounces this kind of behavior, and it is not part of its policy to execute detainees,” the group said. Activists in Azaz are reporting fresh clashes between the FSA — represented by the Liwa Tawhid and other brigades and battalions — and ISIS in Azaz. 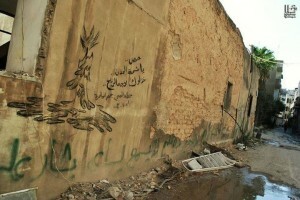 The activists said that the clashes had taken place ever since the failure of negotiations at about 5 PM. According to their report, ISIS fighters were seen traveling in cars eastern neighborhoods and a checkpoint controlled by them. The activists reported that there is popular discontent in Azaz against ISIS’s interference in local affairs, and that even Islamic brigades have opposed the ISIS involvement in the town’s affairs. Meanwhile, Orient News (Arabic) has a report on the situation, which includes footage of Liwa Tawhid reinforcements arriving in Azaz, and the Bab As Salam border crossing. State media reports that Syrian Prime Minister, Wael al-Halqi has visited several sites in the Damascus suburbs, including a Syrian-Iranian joint venture car manufacturing plant. Halqi also visited the Tishreen mill, a firefighter brigade, a minerals manufacturing plant, a cement factory and a gas factory in Adraa. These areas are, of course, under regime control — Tishreen is the site of the Presidential Palace and is located near Mount Qasioun, a regime-controlled military base. The visit — an attempt to show that the Assad regime is in control in the area — nevertheless comes as regime forces continue to bombard opposition-controlled areas of the Damascus suburbs, including those hit in the August 21 chemical attacks. Russian President Vladimir Putin on Thursday expressed surprise at analysis that the initiative to put Syria’s chemical weapons under international control allowed US President Barack Obama to “save face”. “I don’t think that this initiative… allowed, as you said, the fact that President Obama to save face,” Putin told an audience at the Valdai Discussion Club. Footage of the aftermath of a regime airstrike on the small town of Sinjar in Idlib Province. Activists say that at least 15 people were killed and many others critically injured in the strike, which hit a market. An EA correspondent reports that the “Free Syrian Army blocked all roads to Azaz”, near the Turkish border, after negotiations for a withdrawal from the town by the Islamic State of Iraq and As-Sham broke down. It had appeared that Liwa al-Tawhid, one of the insurgency’s largest brigades, had tried to calm down the conflict between the FSA’s Northern Storm Brigade and ISIS, and said they were willing to guarantee a truce by protecting Azaz. However, local activists reported at around 14:31 GMT that Liwa Tawhid was mediating as a third party in negotiations between the FSA and ISIS. A photograph of street art in besieged Homs, with a tag reading “Homs, a candle in the dark… lighting our dreams”, offers an expression of optimism even as the regime continues to bombard the city. What did you do in Los Angeles in the 90s when you had rebels? Didn’t you send your army? You did. In the latest of their regular attempts to say the US might be helping insurgents — even as President Obama and the military have pulled back from any significant provision of arms — Administration officials have told CNN that the Pentagon has “put a proposal on the table” for US forces to train and equip “moderate” insurgents “in a country near Syria”. The proposal is not very new: American advisors have already reportedly been working with some opposition fighters at a base in Jordan, and the CIA has provided some arms — although not heavy weapons — since late 2012. Instead, the chatter covers up not only the pull-back from airstrikes but the failure of the US to fulfil a promise in June to publicly deliver weapons to the insurgency. Amid the sensational reactions to the fighting between insurgent factions in Azaz, the Wall Street Journal breathlessly joins the drama of an “Al Qaeda spinoff” — the Islamic State of Iraq and as-Sham — battling the Free Syrian Army. The Journal gets support from a US official who says, “It’s a three-front war” against the Assad regime, the Lebanese organization Hezbollah, and “the multinational jihadist ranks of ISIS”. In recent weeks, the Journal has been prominent in using “news” to press for US Government support to the Free Syrian Army and Supreme Military Council as “moderate” insurgents. An EA correspondent offers a summary of claims by the Islamic State of Iraq and Ash Sham (ISIS) over the local dispute that sparked Wednesday’s fighting between their fighters and the Free Syrian Army (FSA) in the border town of Azaz. ISIS, who already had a presence in Azaz, said that a German reported had been filming their headquarters under FSA protection. Fighters from ISIS, upset by the filming, tried to take the film from the German’s camera, prompting the FSA fighters protecting him to act by killing two ISIS fighters. ISIS said they then pursued the FSA, who tried to flee with the German over the Turkish border via the Bab As Salam border post, where the two groups clashed. ISIS say they did not storm Azaz, as they were already in the town. The President of the Syrian Arab Red Crescent on Thursday warned that millions of Syrians will be at risk this winter, if critical aid supplies cannot get through. Around 4.25 million Syrians are displaced inside the country, with a further 2 million having fled as refugees to neighboring states. Many fled their homes with little more than the clothes on their backs. Dr Abdul Rahman Attar said that displaced Syrians will face severe hardships in the absence of aid, with mattresses, blankets, kitchen kits and hygiene kits being “priority needs”. “Winter is coming and the needs are extremely important for these people. Can you imagine in the winter time, 4 or 5 million people who have had their houses destroyed, who have no place to live, living under a tree or in tents?” Attar said. In comments on Facebook, activists in the border town of Azaz have shed light on the ongoing conflict between the Islamic State of Iraq and local groups. There are thousands of question marks over ISIS, especially the actions of its members and the timing of those actions. We make a distinction between Jabhat al Nusra, which broke away from ISIS due to serious deviations from the our goal, also a Chechen battalion defected for the same reason – the immigrants came for jihad and not for the Emirate [ISIS] and control over areas that are liberated thanks to solidarity of its sons [i.e. 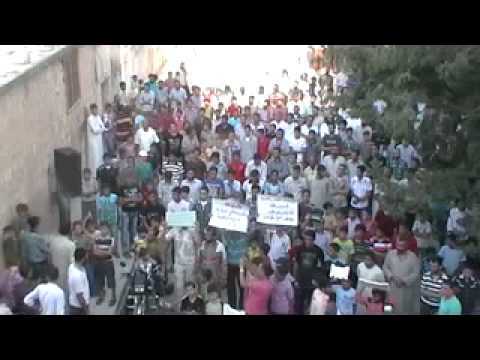 locals], and Azaz was freed by citizens of the city and the Aleppo countryside, with the help of the sons of Idlib. Earlier on Thursday, local activists called for ISIS to withdraw from Azaz and for the town to be placed under local control. On behalf of the people of Azaz, we call for the withdrawal of all forms of armed [fighters] from Azaz and the restructuring of the local council with all the city’s families [i.e. local people should run the council] and it shall be managed by the town with expertise and experience, and [in a way] unaffiliated with any faction. Activists in Azaz reported on Thursday morning that the authorities have closed the Bab As-Salam border crossing between Syria and Turkey to safeguard civilians amid clashes in the city. The fighting is, in part, for control of the Southern Bypass road that separates Zamalka from Jobar. Since the chemical weapons attacks, the regime has tried to advance tanks along that section of road, but has been attacked by Free Syrian Army fighters. Activists in Syria report that a car bomb, planted by FSA fighters, exploded on Thursday morning in a building used as a regime base on the Southern Bypass near Jobar. Inside Jobar, insurgents are attacking regime forces and targets both in the neighborhood itself and in the center of Damascus. Syrian State media have provided clues as to the targets of these attacks, with SANA reporting on Wednesday that insurgents had targeted the Al Amara, Qassa and Al Abassiyeen areas, just to the south of Jobar. Assad repeated that he had agreed to the inspection and handover of the chemical weapons not because of any US threat of airstrikes, but in co-operation with Russia’s initiative launched last week. The majority of the innocent people have been killed by the terrorists, not by the government. No wise government in the world would kill its own people. The Local Coordination Committees claim 107 people were killed on Wednesday, including 31 in Idlib Province, 25 in Aleppo Province, 24 in Damascus and its suburbs, and 16 in Daraa Province. The Violations Documentation Center puts the number of dead at 73,444 since the conflict began in March 2011, an increase of 115 from Wednesday. Of the dead, 55,131 are civilians, a rise of 79 from yesterday. SUMMARY: Wednesday’s headlines were seized by fighting between insurgent factions in Azaz, near the Turkish frontier, as the Islamic State of Iraq and as-Sham ejected the Free Syrian Army’s Northern Storm Brigade from the town and threatened to take over the Bab al-Salam border post. While significant, the events were not the “bombshell” in Syria that those observers declared for readers. The “war” was a local dispute that escalated, with ISIS wanting to “arrest” a German doctor working for Medecins Sans Frontieres. When the Northern Storm Brigade blocked this, ISIS responded with gunfire, killing at least six members of the brigade and taking over Azaz. The jihadist faction then attacked the border post but was repelled by Northern Storm, who were soon reinforced by Liwa al-Tawhid, one of the largest and best-armed brigades in the insurgency. By last night, as Liwa al-Tawhid brought in more forces from around Aleppo Province, the question was being put to ISIS: would it continue to hold Azaz, risking a confrontation which it is likely to lose, or will it seek a negotiated way of the conflict? It looks like Tahwid made a deal. ISIS retreats to the Menagh airbase [captured by insurgents in August]. Leaves Azaz and border alone. Not allowed to have checkpoints. Strong Tahwid garrison in Azaz will enforce that permanently. Some details not known yet.